For Japanese intellectuals, the encounter with European geography in the mid-sixteenth century meant more than a simple, physical dilation of the world. More profoundly, it meant overthrowing the traditional Buddhist worldview. In the process of confronting a greatly expanded set of continents, educated Japanese had to fundamentally transform their understanding of Asia. Since the ninth century, the prototype of the world for most Japanese had consisted of Three Sacred Countries—Tenjiku 天竺 (India), Shintan 震旦 (China), and Honchō 本朝 (Japan)—surrounded by numerous minor lands. In a traditional world map, the bulk of the world consisted of India and China, which were always depicted in the center. By contrast, Japan was located to the northeast as one of many peripheral countries. One mission of ancient and medieval monks had been to overcome this miserable situation and articulate Japan’s sacredness if not superiority in the world. In the context of this longstanding challenge, the arrival of European atlases and world maps presented an opportunity as well as a threat. Armed with new knowledge of the globe, some Japanese cartographers leapt at the chance to relativize the position of China and India. Others altered their maps more slowly, and with more reluctance. 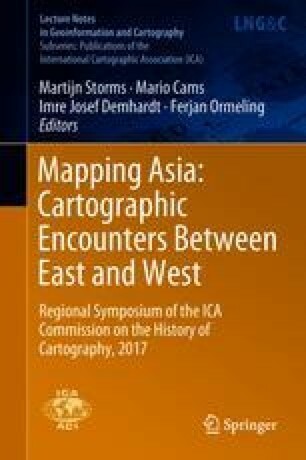 By illuminating the geographical imagination embodied in early modern world maps, this paper explores the impact of this process on Japan’s traditional Asia-centric worldview.